We understand that it’s not always easy on our users to wait up to 24 hours for a reply in support, so we’re working on ways to address that. Until we look into possible improvements in our support tickets system, we’re making some other changes to help you out quicker. The first major step was to introduce a new Knowledge Base last year. It has continued to be worked on to address the majority of issues, tutorials and more. More articles will be added throughout 2019, however, we’ve now taken it a step further. In the latest update of our free core plugin, version 4.12.1, we introduced the Support Beacon. From the “Help & Support” section of WP RSS Aggregator, right from within your WordPress dashboard, you can enable our new Support Beacon. This does exactly the same thing as the beacon on our main website does. Free users can search our entire knowledge base without ever leaving their site. Premium license holders can take it a step further by contacting us directly from within the beacon itself. That’s right, you can message out support team without ever leaving your site. The beacon even maintains a history of your messages with our support team so it’s easier to look back at previous discussions. Wondering How It Works? Try It Out! We have had the Support Beacon available on our main website for a few months now. Since then, many users have contacted us directly with pre-sales or technical questions, speeding up the process and making their lives a little bit easier. Try it out no the bottom right-hand corner of this page. Just remember, users of the free core plugin only will not have the “Ask” option at the top of the Support Beacon when it is enabled on their site. If you’re worried about tracking or privacy issues, we’ve got that covered. Our Support Beacon is only loaded on WP RSS Aggregator pages. It never gets loaded on any other pages on your site, ensuring that we never track any of your behaviour across the rest of your site. The only time that we track your behaviour is when you submit a support ticket through the beacon itself, and even then we only collect limited amounts of data. We simply get a list of the previous WP RSS Aggregator plugin pages that you visited on your site before sending your message. This helps us to understand your actions a little better. We don’t collect or see any click data, personal data, or other types of data from your site. The Support Beacon can be enabled or disabled at any time from the Help & Support page. Once disabled, it is never loaded on any page on your site. You can even choose to only enable the Support Beacon when and where it is needed. We have more plans in place to improve our self-help solutions, support systems, and the plugin itself. 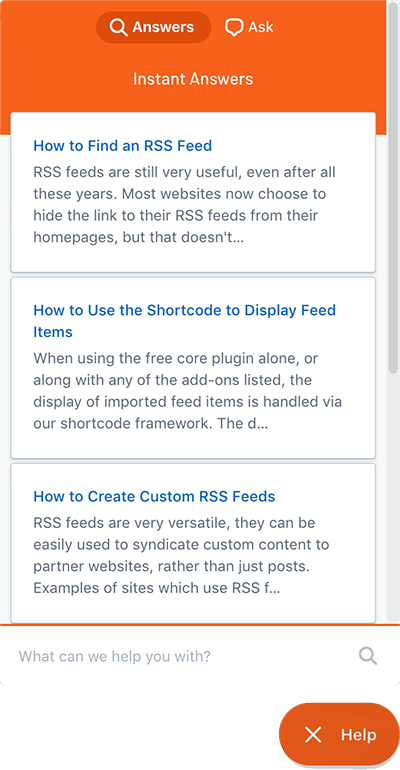 Keep an eye out for more core plugin and add-on updates in the coming weeks as we take WP RSS Aggregator to the next level.